A word of warning: if you have not seen last nights finale of LOST yet, don’t read further. There will be spoilers. It’s over. Six years of intriguing story has finally come to an end. While I am still processing the plot, I was generally pleased with the 2.5 hour episode. I think the entire sideways-flash-world was some sort of afterlife/limbo/purgatory. But the island was real. In many ways I felt like this was a bit of a cop out. They could have stayed away from the “I see dead people cause we are all dead” ending there and moved toward a more sci-fi ending, with an alternate reality that could not continue to exist. To a person, those who “remembered” their previous lives seemed to prefer the real life to the one that they had created together in sideways-flash-world. The final scene did not have to be Jack’s dad revealing that they were all in an afterlife. It could have been Desmond leading them to flash back to the island, to a reality that was required to be real because the power of the island had to continue for reality to continue. But on the other hand I was pleased to see the writers give a significant nod to the spiritual aspects of the show. So yes, the sideways-flash-world was an afterlife construct where they all had the chance to live out what could be considered their preferable lives, but in the end they all drifted together. And then moved on, through the glowing doors, toward the light. My favorite part of the episode was watching how all the characters remembered. We were all reminded of their most critical moments in the show. Very emotional. This storyline was all about emotion, and not about explaining things. The other storyline was about explaining, sort of. The start of the season, that was where we were first introduced to this alternate timeline. Some will probably think that the nuclear bomb killed them all, and both parts of the show were in the afterlife. I think there are too many loose ends and inconsistencies to have that theory hold. I think that the nuke’s blast broke through to the pocket of energy, and everyone time shifted back to the “present”. The blast from the bomb was consumed by the pocket of energy, so the reality was that they changed nothing in the past. And therefore, Juliet was in the wreckage of the hatch, and died in the arms of Sawyer. The blast fixed the time issues, but did not change the past. When we saw Jack die, that was him actually dying. Everyone else that died on the island, died then for real. Then they were all together in the sideways-flash-world, in that time, because as Jack’s dad said, there isn’t really any time after death. I was a skeptic about a Netflix account. I was sure that it could not be as described. You just get movies that are at the bottom of the queue. The movies available for streaming must be ones you have never heard of. there is no way that $9 bucks a month get’s you more than a couple movies a month you actually want to see. I own two blu ray players that can stream Netflix, and an Xbox 360, and have access to an iPad. A friend emailed me a link to sign up for a free month, so I decided to see what it was all about. At least I would watch a couple of movies for free. I was unprepared for the selection; not just hundreds of movies, but hundreds of pages of movies to select from. Quite a few are available for streaming with pretty good video quality. I was able to link in my devices very easily. The iPad can both manage the queue and stream movies. I started watching the Voltron series with my son. He loves it. (He did ask why the picture didn’t fill the whole screen of my HDTV.) We have also enjoyed several cartoon classics, as well as more recent movies. The selection of documentaries is pretty good, too. I loved “Lord, Save Us from Your Followers“, which I had heard about when they were filming it. The dvds that are shipped have come quickly, a by product of having a Netflix shipping center in Orlando. And every movie they have sent has been the one on the top of the queue. I know that won’t always be the case, but so far it has been great. Even the rating/recommendation settings have been pretty accurate. I got a couple of movies they said I would not really like, and they were right. I didn’t like them. I provided Netflix with answers to a quiz on my movie preferences, and rated a few films I had seen. Now, when I browse movies, they rate them according to what I said I liked or disliked. So far, I have been very pleased. For people of my generation, it’s hard to do. We were born a few years after the time our parents had their faith in the US government shaken by Vietnam and Watergate. Whether they intended to or not, they passed on the expectation to distrust authority. When I was growing up, I, like many, was drawn to the phrase “question authority”. I still submitted to it, but I questioned it. I’ve never been one to simply accept something without a reason or cause. As a result, I often consider that I know what is “best” in every circumstance, for everyone. I never share that knowledge unless asked. But if you ask, I will tell you. And since I know what should be, I question decisions that do not follow my opinions. Nice bit of circular logic, isn’t it? I obviously do not actually know what is best, but I often think I do. Trust is this fragile thing, that grows over time. It is easily fractured, easily crushed. But not easily repaired. Trust overcomes the need to be right, and overshadows the desire to question. Trust can overcome generational tendencies and personal inclinations. But it’s hard. Years of joint experiences have bred trust between some that I work with, and for. Normally we are in sync with direction and decisions, but when we are not I know that my ideas and views are considered, even if they are eventually rejected. I know that they have experiences I do not and they may be in possession of facts I am not. In a seemingly natural outgrowth, trust happens when people come together following the will of God. They work together for common goals. Over time they learn each others strengths. Those in authority learn to listen to those surrounding them. Those who “lead from the second chair” (or third or further down) learn when to simply accept a decision. That is a hard thing for me to do. It requires a conscious decision on my part. It doesn’t come naturally. When decisions are made, I believe they sought God. I believe that they have sought wise counsel. I believe that they are in possession of information I do not have, which may skew the decision away from the obvious (to me). I trust. I trust that in the same situation, with the same responsibility to make the call, I would end up with the same decision. I trust. In about 1 month Apple sold over one million iPads. That’s about twice as fast as they sold one million iPhones. According to the story, this past weekend’s 3G availability pushed sales the rest of the way. The average price of an iPad app is $4.67, and with over 12 million apps downloaded… that’s a lot of money. With a user base of that size, and growing, makes a guy want to learn programming. It was not all it could be. First, we were not really using it to drive content to our own site. A huge, but easy, mistake with social media. 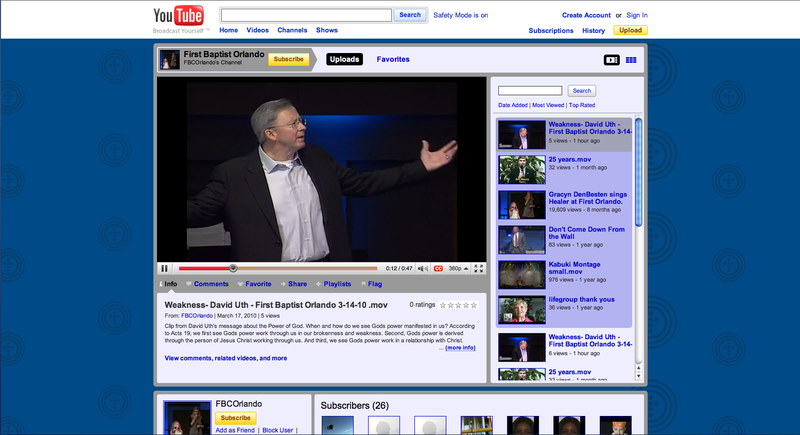 All social media should drive viewers to your own church’s site. Never take people who are viewing your website to a social media site. Use that social media to generate views of the content you create and control. Second, it was very bland. I am no graphic designer, but surely I could do more. I mentioned to our creative area that I was going to bring a project to them, but in the mean time I tried to help us along. OK, it’s not much of an improvement, but it’s a step forward. 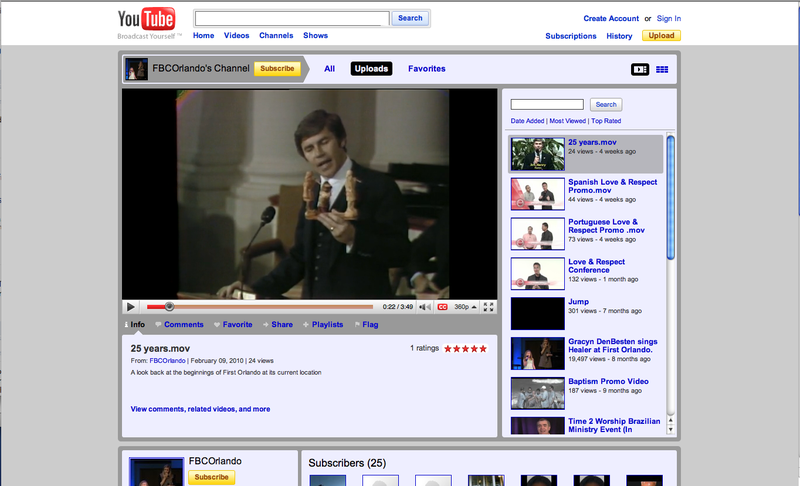 The biggest thing is that we started taking clips from the service archives, and using them to drive people from Youtube to our archive player, where they can see entire services. Next step, make it look better.